It was in the 90s that Norman and Glen BRADFORD oriented their research toward the Japanese plum and other similar species. Based on the genetic cluster created by FW ANDERSON, they triple the resources devoted to the new project: the number of hybrids produced and evaluated gradually passes from 1,000 to 25,000 every year! Interspecific crosses with the apricot yield exceptional results. This is the estimate of the number of plum varieties cultivated. One arbitrarily distinguishes between dessert plums and drying plums. Some are self-fertile, but most produce better in cross-pollination. See our plum varieties. Metis® Tonic is harvested in late summer and autumn. Therefore Metis ® Tonic keeps the nuances … of the summer sun. With its reddish skin and yellow flesh, it is taste is extremely sweet. Very juicy, it brings a breath of freshness after the heat. Metis® Safari is the most exotic variety. Its thin skin and crispy flesh gives the fruit a original tart flavour. Metis® Aroma is a slightly purple fruit with yellow to red flesh. Remarkably soft, it is a fruit that ripens under the sun with persistent aroma and juiciness. Another asset: wide commercial availability from mid-June to the end of December. implantation on evaluation orchards.The adaptation ability of new cultivars with various European territories is evaluated in Andalucia, Estrémadure, Midi-Pyrenees, Rhône-Alpes, Languedoc-Roussillon and Emilia Romagna for several years. implantation in pre-commercial orchards.The trees here are grown to evaluate the behavior of thee cultivars in real-time conditions. Ultimately, only the best varieties will be grown in production orchards. 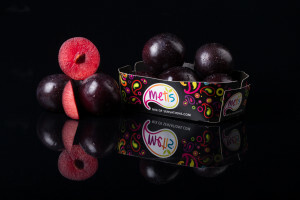 They will complement the range of Metis® plums placed on the market. Production of high quality fruit expressing all the flavor of the program’s varieties. Proposal of attractive packaging, enhancing the quality of the product to meet consumer expectations. Promotion and market development of production using a model that privileges economic progress for all project stakeholders.